Master Splinter is leading the Turtles to a new home now that Shredder has violated their once hidden sanctuary. On the way, they are soon met by Desolation, the skull-headed crow sent as an emissary by Animus. The creature immediately dives towards the fallen Turtle and disappears into his chest. The TMNT remains defiant and battles the beast, but it has grown to epic proportions and the battle is hopeless. 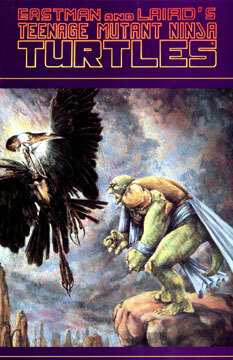 The Turtle flees into a cave, where he meets the bird once again. The foul fowl finally tells the mutant that he must chose between life and death… life is the answer.